DESOTO—DeSoto Resident Karl Robin Enriquez Cagulada is both an artist and an inventor. 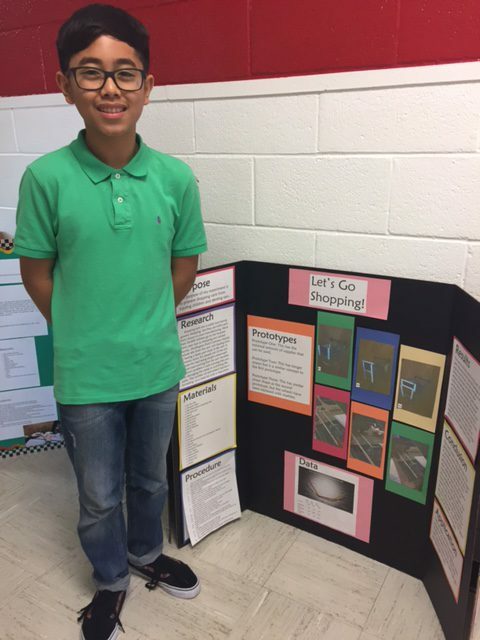 His science project this year was practical: creating a shopping cart that wouldn’t cause harm to cars if they escape and crash into a vehicle. Saving others is in his future. The son of a nurse and a medical technician, Karl plans to follow in his mother’s footsteps one day. His mom, Herminia, has been a nurse for as long as he can remember. She works at UT Southwestern Medical Center. His father, Floro, works at a med tech at Medical City in Arlington. The two have inspired him to also go into the medical field. 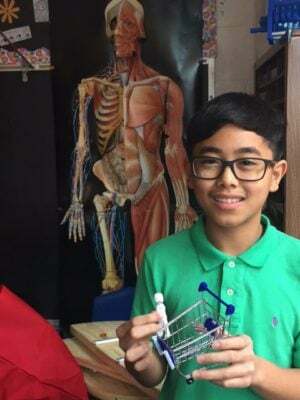 He admits he’s a “Science guy” and enjoys the annual St. Elizabeth of Hungary Science Fair. His project just came to him one day, when he realized how upsetting it can be to have a nice car dented by a rogue shopping cart. It occurred to him that a simple solution would save a lot of people headaches—and repair bills. He ordered mini shopping carts on line from Amazon and began tinkering with them to pad their outer corners to make them bounce off cars, protecting them from potential harm. Karl came to St. Elizabeth’s from The Merrywood School for exactly that: more technology and science. Now he’s learning how to create websites, among other technological advancements. St. Elizabeth’s is currently in the middle of a fund-raising campaign to build a new science lab. The Creative Learning Systems Lab will cost about $175,000. In addition to creating practical inventions Karl Cagulada loves to travel and take landscape photos and has been to Canada, the Philippines, Ireland, England and Hong Kong. Karl spends a lot of his time in the current science lab, and the computer lab right next door. Lucky for him, the school’s Science teacher, Mrs. Rice, is also his home room teacher, so he has plenty of access to an expert in the field. His favorite other subject is Art. Art teacher Ms. Green inspires him to create beautiful things. His handwriting is exceptionally pretty, and he writes in perfect script—a lost art in public school. His flowing script would look beautiful on any wedding invitation or graduation announcement, and might be away for him to help pay for his college tuition one day. He credits his art teacher Mrs. Green for his love of art and music teacher Mrs. Erin Niedbalski for his love world music and culture. When he first came to St. Elizabeth’s he was surprised at the size. He admits his former school was very small, so any change would have been scary. Fortunately, he made friends right away with classmate Madison Brooks, and Savannah Flores, and the three will graduate together in May. Karl hopes to continue his science and art courses at Bishop Lynch in east Dallas. And then it will be on to college to become a nurse practitioner. Following in his footsteps is his younger brother, Karston, a 7th grader. The two brothers share a room at home, and get along pretty well, according to Karl. Both were born in Dallas at Medical City, and now live in DeSoto. Karl admits he’s not very competitive. He does have a lot of hobbies: he enjoys art, photography, Origami, filming and travelling. He has a love of aviation and enjoy watching commercial planes fly, and learning the science behind them. His favorite pastime is drawing anime’ characters and cityscapes by free hand. He knows he’ll continue to draw even as he begins is career as a nurse. After all, science and beauty often go hand in hand. Karl Cagulada is the perfect example: a future nurse-practitioner with a talent for drawing and helping people get back to their beautiful, healthy, best selves. The public is invited to an Open House on February 8, 2017 at St. Elizabeth Of Hungary Catholic School from 8:00 a.m. to 3:00 p.m. on Wednesday, February 8, 2017. The school has classes from pre-k3 to 8th grade. Potential students and their families are invited to tour the school and meet the exceptional faculty and staff. For more information, contact Sandy Walkley swalkley@saintspride.com or (214) 331-5139 x21.